High performance, low latency, 4:2:2 video encoder built to tackle the unique challenges of professional outside broadcasting. More than 20 years of real world outside broadcasting experience went into the design of the Gryphon PVE-3. Earlier generations of DTVI’s encoder family have been deployed in almost every country in the world, helping broadcast customers tackle the unique and demanding challenges of news and sports contribution. DTVI’s Gryphon PVE-3 Contribution Encoder builds upon those achievements while delivering new levels of performance including ultra-low latency (150 ms) and 4:2:2 10 bit compression. Setting up a video encoder can be challenging at the best of times. Errors made while configuring encoders with complex menu trees in the high-pressure environment of a major sports or news event can prevent live shots from getting through. Gryphon PVE-3 has been designed to enable operators, who might not be experts in video compression, to set up contribution links quickly and easily – getting on-the-air in less than 60 seconds. Extremely intuitive menus and front panel controls allow operators to define and enable compression and modulation parameters with only minimal training. For users who prefer Web based control, the built-in Browser interface is equally intuitive and easy to use. Ensuring success in an outside broadcast transmission requires interoperability with both the content being sent, and the equipment used to receive it. The Gryphon PVE-3 handles a very wide range of news and sports formats: including PAL or NTSC, resolutions of 480i, 576i, 720p or 1080i, in MPEG-2 or MPEG-4, 4:2:0 or 4:2:2, 8 or 10 bit encoding. Combined with DTVI’s commitment to open standards and full interoperability testing with the world’s leading decoder vendors, you can rest assured that the Gryphon PVE-3 will work in any broadcast environment. At DTVI we understand that your needs may change over time. Gryphon PVE-3’s flexible, software license-based architecture allows you to purchase only those features required today, and upgrade to a more advanced feature set including High Definition (HD) and 10 bit compression as your requirements evolve. 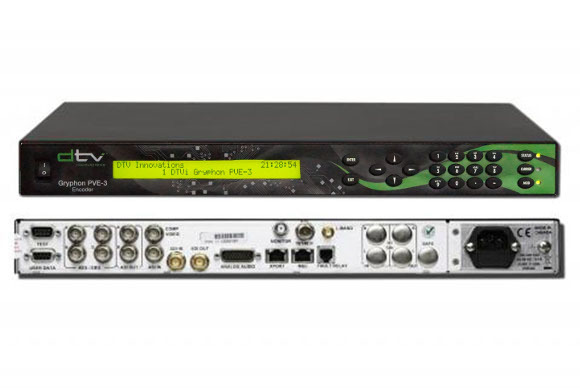 With a highly flexible and functional modulator, and the ability to add features such as an internal multiplexer, BISS encryption, and advanced audio and video formats, the Gryphon PVE-3 is capable of changing to meet your business needs. While everything else is important, impressive audio and video quality is critical to successful broadcasting. Through its unique combination of ASIC and FPGA technologies, the Gryphon PVE-3 delivers industry leading video and audio compression quality with compression optimized for low latency News and Sports applications. Advanced features such as dynamic GOP; scene change; fade; and skin tone detection, allow for optimal picture quality. The Gryphon PVE-3 is inherently a low delay encoder supporting 4:2:2 and 4:2:0 compression for interview transmissions, and single camera feeds can take advantage of extended GOP structures to provide outstanding video quality at industry leading low bit rates. The combination of DVB-S2 modulation and Gryphon PVE-3’s advanced MPEG-4 AVC compression allows operators to deliver outstanding audio and video feeds at a much reduced satellite bandwidth cost. Most Gryphon PVE-3 users report being able to provide HD contribution feeds in an equal or smaller bandwidth than they had previously used for SD transmissions.